Just spent this last week finishing, framing, and hanging my paintings at the Santa Barbara Tennis Club. It is a group show called, "Night Shift". 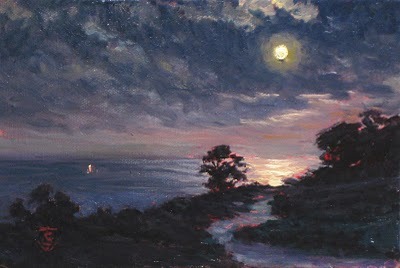 I am exhibiting my plein air (open air) nocturnes along with fellow noctural painters Cyndi Burt, Filberto Lomeli, Doreen White, and Paul Cumes. The show is up, it looks good. Come to the opening if you can on Friday June 11 from 530 to 730. The show will be up until July 6, 2010. I'm pleased to say I have sold two of the four paintings sold thus far, in the pre sale hours before the event. This is one of my paintings sold, and it is a fine thing to know people are willing to buy art in this Economy. It is a great neighborhood in which to exhibit.